Not too long ago, we talked about the terabyte home. Now the proliferation of digital cameras, digital music and digital video only begs the question of whether a terabyte is enough to store it all. But storage is only part of the problem – once we've got it, we don't want to lose access just because we step out of the house, or for things to get too technical. That's the problem Dane-Elec's MyDitto is aiming to solve. It's a simple-to-use NAS (Network Attached Storage) device that lets you connect to your files securely over the internet, without needing any complex firewall configuration. It's that last part that's most interesting, because up to now, connecting to storage from outside your firewall wasn't the easiest thing to do. With MyDitto there's no need for any fiddling with routers – you just need a USB key to be able to connect from anywhere. Open MyDitto's box and you'll find a relatively conventional looking two-bay NAS. Our review sample came with one bay filled with a 1TB drive and the other empty, ready for you to add your own SATA drive for additional storage, or to use MyDitto's RAID features. If you want to protect your data from the start, there's an alternative RAID-ready configuration also available with two 500GB drives. You can install up to 4TB of storage in total, with support for 2TB drives. Drives are mounted in a pair of easy-to-release bays, accessed from the rear of the case. There's no lock, so you do need to be careful of accidentally unplugging a drive. Getting started is easy – just plug in the drive and hook it up to an Ethernet connection. In your own network, MyDitto looks like any SMB-capable NAS box. It comes with media-sharing capabilities, with a DLNA server and support for iTunes, so you can use a MyDitto to stream media. Each MyDitto comes with two 2GB USB keys, one white and one silver. The white key is a user key that gives access to a user's files, along with any public shared content. The silver key is the administrator key, which opens up additional controls, letting you control just who has access to the drive – for instance, if someone loses their key, they can be locked out. Administrators can also reformat drives, and enable and disable RAID support. If you lose the master key there's an option to reset all the keys and create your own new master key. You don't even need to use Dane- Elec's own USB keys – any USB stick will do, and it's even possible to copy and run the connection software directly from a PC. If you're in the same network as a MyDitto, it'll connect directly. Remote access is handled differently, with the application on the USB key connecting to Dane-Elec's dynamic DNS server. As each key is paired with a specific MyDitto (each MyDitto can have up to 29 users, with six connecting at any time), connecting opens a direct peer-to-peer link between the client application and the MyDitto, linking across router firewalls. If a direct connection can't be made, traffic is routed through Dane-Elec's servers. The client software is easy to use, with an Explorer-like two-pane view of your PC and the remote MyDitto. You can drag and drop between the two panes, though you'll probably prefer to use Explorer. There's support for streamed audio over remote connections, and you can use the tool to manage the built-in BitTorrent application. There's no way to mount a remote MyDitto as a drive, but a promised update will add that feature. The bundled software also includes a backup tool that kicks in when connections are available. 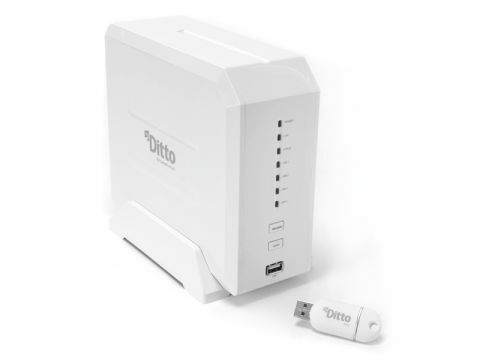 The MyDitto is a well-designed NAS drive, with software that simplifies using network storage. While only competitively priced at that, where it really excels is in just how easy it makes remote access. If you need to share files on the road, it's well worth considering.